As you know I have renewed my Project Management Professional (PMP) certification for the second time. The Project Management Institute (PMI) has changed its PMP renewal requirements. Once the process is over with, it clicks that I am now a project management mentor. 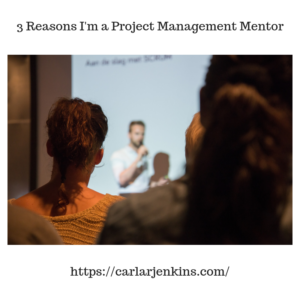 Here are my 3 reasons I am a project management mentor. When I first received my PMP in 2013, I was new to the process. Not anymore. I have renewed my PMP certification twice. There is so much knowledge that I have accumulated over the previous 5 years. I know that I can help someone with my knowledge. Since 2013, I have established myself as project management authority creating videos, podcasts and blogs. I have documented this second PMP renewal on video here. I have thus far amassed 1900 LinkedIn Followers, 1700 Twitter followers and 2200 Pinterest followers. People listen to what I say. I have the ability to reach so many more people now than then.